The Holy Monastery of Arkadi (Moni Arkadiou) (Μονι Αρκαδιου) is the most famous monastery on Crete. It dates from the First Byzantine Period. Thoughts on who founded Arkadi Monastery differ in that some believe its founder was the Byzantine Emperor Herakleios and that it was constructed by Emperor Arkadios in the 5th century, while other experts believe that it was established and named by a monk called Arkadios. The layout of the monastery is square and fotress-like. The cells of the monks are on the four sides around the courtyard with the katholikon (church)standing in the centre. Their is a museum displaying many items of historic interest including icons and relics from the time of the Turkish attack. The gardens of the monastery are beautiful with an enormous variety of roses and other flowering plants. Vines grow around the courtyard. Dating from 1587, during the Venetian period, the church has an inscription showing the date of its construction. The church has two naves, one dedicated to Saint Constantine and the other to Saint Helen and to Our Lord. Its façade preserves examples of Cretan art from the 16th and 17th centuries. Part of the burnt iconostasis that survived the 1866 holocaust has been preserved and can be seen in the in the south-west corner of the church. By the 16th century Arkadi was already established as an important cultural and monastic centre. The monastery housed a library and operated a school. Many monks were in residence, engaged in the art of meticulously copying books and documents. The invasion of Crete by the Ottoman Turks affected Arkadi's cultural activities for a short time, restricting it but this did not last for long and Arkadi was granted a unique privilege by the Turks - the monastery was allowed to ring its bells. Arkadi is most famous for the part it played in the revolution of 1866-1869 against the occupying Turkish forces. As a refuge for individuals taking part in the rebellion against the Turks, Arkadi came to the notice of the ruling Turkish Pasha in Rethymnon, who issued an ultimatum that the Monastery should cease its aid to the Cretan freedom fighters or face destruction. The Abbot of Arkadi, Gabriel Marinakis, refused. This resulted in an attack on Arkadi in November 1866 by 15,000 Turkish troops. Over 900 Cretan people were within the Monastery at the time of the attack, most of them women and children. Only 300 of the Cretans were able to bear arms and they were outnumbered by the Turks. The Cretans feared being taken captive by the Turks more than they feared death itself because of the Turkish soldiers terrible history of atrocities and as a final act of defiance in a plan blessed by the Abbot himself, they made their final stand against the Turks. As the Turkish soldiers broke into Arkadi, one of the rebels, Kostis Giamboudakis from the nearby village of Adele, set fire to the gunpowder magazine where he and all the other Cretans were sheltering from the Turks, resulting in a huge explosion which tore the monastery to pieces and killed more than 2000 people, over 800 Cretans and 1500 Turks. Around 100 Cretans who survived the blast were immediately taken prisoner by the Turks and executed. Only 2-3 rebels survived, individuals who evaded capture by the Turks. The 1866 holocaust at Arkadi is one of the most major events in Cretan history and has made the Arkadi Monastery a living shrine and a monument to freedom. The holocaust is commemorated every year around the 8th November and thousands of visitors and dignatories visit to pay their respects. A memorial service is held in the church and a military and civil ceremony takes place near to the Ossuary in which the bones of some of those who died can be seen. Restoration of Arkadi began shortly after the explosion and within four years the main central entrance with its vaulted passageway was already reinstated. 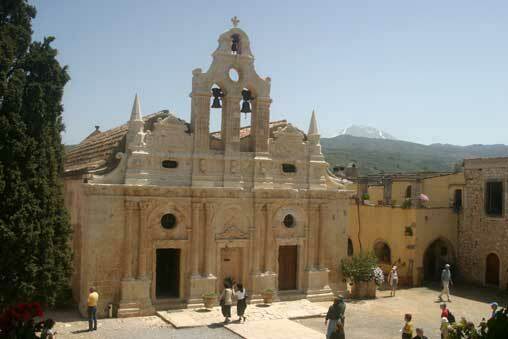 Arkadi Monastery is around 23 kilometres from Rethymno. It is well signposted from the main highway and from Platanias, near Rethymno.